The iPhone app store is a huge success for Apple (AAPL), with more than 1 billion apps downloaded in nine months. But it’s also turning into a hot acquisition market. And they have done a few other deals over the past few months. For example, Amazon rival Barnes & Noble (BKS) purchased an entire e-book platform — Fictionwise — which includes an iPhone e-reader app. Tumblr, the NYC-based blogging service, purchased an app called Tumblrette, which is now the official Tumblr app. This makes sense. Many of the most successful apps are nimble startups run by a few people with little or no outside funding. That means apps can be acquired — and engineers and designers can be ‘acq-hired’ — for a price that’s fair to the buyer and probably very nice for the seller. Apple Readying MacBookMini or iPhone Lite? Apple’s iPhone OS 3.0 code carried details about Apple’s upcoming products. Two different reports indicate that white-fruit themed toy maker is working on two separate products. According to the recent buzz, Verizon is in talks with Apple for striking the iPhone deal. Now, two folks ‘familiar with the matter’ revealed that Apple would be rolling out two devices with Verizon. Rumors and Apple go hand in hand and that’s not new to us. BusinessWorld recently reported that the two ‘insider sources’, both Apple and Verizon are in talks to release a new ‘iPhone lite’ and a tablet like device which is due this summer, supposedly with the final release of iPhone 3.0 final version. Very few details are mentioned over the cheaper, smaller ‘iPhone Lite’ which remind us about the rumors that came out in mid-January about the iPhone Nano. However, the other device dubbed as ‘mediapad’ has quite interesting details. Users would be able to listen to music, watch HD videos, view photos, and even allow VoIP calls over WiFi on the Mediapad. This Mediapad is likely to be the unknown iProd device which will be like Amazon Kindle and have hardware version N18AP as previously discovered from iPhone OS 3.0 code. Also, The Unofficial Apple Weblog (TUAW) got tipped about Apple’s possible next major device MacBookMini through Adium Statistics link. Adium client is iChat alternative for the Mac OS X platform and a reader passed on an Adium Stats link that had information about MacBook Mini. As TUAW notes that earlier, MacBook Air was showed up in Adium Stats on the site. Nevertheless, the feedback from the developers and respective product cycles do indicate the introduction of new products from Apple. For that matter, all eyes would be eager for the WWDC 2009 that starts on June 8. NBA Game Time iphone app has been designed by NBA Digital and is the first app to provide quick updates on the scores and standings of the NBA games. If you are a die-hard NBA fan and want updated scores from time to time, then this is the app for you.The app is free to download from the iTunes App Store. The app is quick to load. Once loaded you are presented with an NBA logo, with 4 tabs along the bottom. The App keeps track of the in-depth scores, schedule, standings and playoffs brackets.On the landing screen under scores, you can select yesterday’s, today’s, or tomorrow’s scores. A red number icon indicates if any games are currently playing live. When tapped on a day, it gives you a scrolling list of all the games that are being played on your selected day. It also tells you the TV network it will be on, the time of the game and the teams playing. Touching a game gives you a subview containing team boxscores, player stats, and team stats. From the “Schedule” view you can pick a day from the calendar to view all the games scheduled for that day . The “playoffs” tab let’s you swipe to the left or right to see a complete rundown of the brackets. I shows all the games in the series, the scheduled timings for the games and the network it will be broadcasted on. In ‘Standings’ view, users can see the regular season standings. The top 8 teams from each conference are highlighted to show eligible teams if the playoffs were to start today. To conclude, NBA Game Time is a real solid sports application providing its users live game information. “Wheels on the Bus is everything one could look for in a children’s application. With its great artwork, music, sound effects and interactivity, it is sure to be a great addition to any mother’s collection. Definitely pick it up!” — AppVee review: 4.4 stars out of 5. Wheels on the Bus is an $0.99 application for the iphone and ipod touch. This app in available in five languages and is based on the nursery rhyme. It has instruments and recording support, turning it into a great educational tool for young children.The app was created by duckduckmoosedesign.com, with the aim of providing a great experience to children. Resembling an interactive storybook the colors are bright and clean, and the illustrations are well thought out. Different sounds have been given to every animation giving life to it. The best thing about the app is the ability to change the music with all the extras offered. You can select different languages(English, French, Spanish, Italian, and German), and so sing along in any of the language you like. Also you are given an option to select just certain types of instruments (Violin, Cello, Piano Trio, Duet, Kazoo and Gibberish) so your child can learn about the sound it creates. You can touch, explore, and discover fun surprises in the captivating, interactive illustrations. The last feature about this app is the the ability to record your own voice. The only reservation about the app is its music which can be a little annoying for the parents but can be switched off. Also while the music is turned off the sound effects can’t be turned on. Overall the application is a complete source of entertainment for the kids. 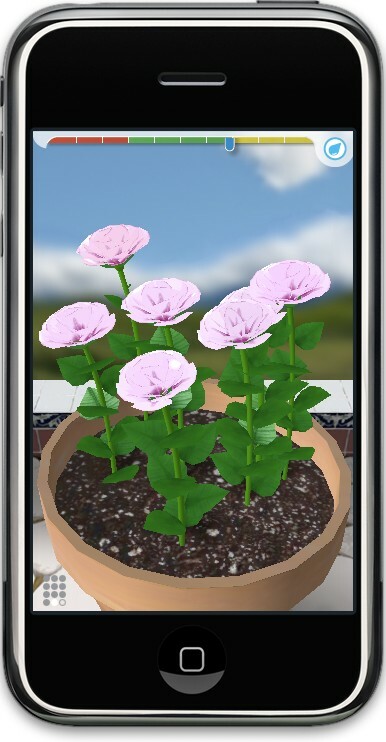 The first update is already under development and it will feature color variations for each seed, labels for each pot with flower information, cross-pollination to let you create your own flower hybrids, and many more features.